Little do they know it, but I often perform experiments on my friends. Last month I made some Orange Cream Fudge and loved the results. I wanted to do a twist of that recipe just for Fall. I made a batch of this fudge and brought my “experiment” to an event at my church. I frequently “test” my recipes on my friends before passing them on to my lovely readers. Shhh…don’t tell anyone! I was pleasantly surprised to find a lot of people really liked it. There’s nothing quite like creating something that brings people happiness! This Candy Corn Fudge is super easy to make and only calls for three ingredients! Tasty, easy and inexpensive? What more could you want? Line a 8x8 square baking dish with parchment paper. Melt white baking morsels gently in either a double boiler on the stove or the microwave. Be sure to melt it slowly since this tends to burn easily under high heat. Pour melted chocolate into a large bowl. Add frosting to the chocolate and stir both ingredients until well blended. Immediately pour fudge into parchment paper-lined dish. Gently press candy corn pieces into fudge in one inch increments. Place the fudge in the refrigerator and let it solidify in the fridge for at least two hours. Remove fudge from dish and place onto a large cutting board. Cut into one inch pieces around the candy corn and serve! Leftovers can be stored in a covered container in the refrigerator for about a week. Looking for more fun Fall treats? 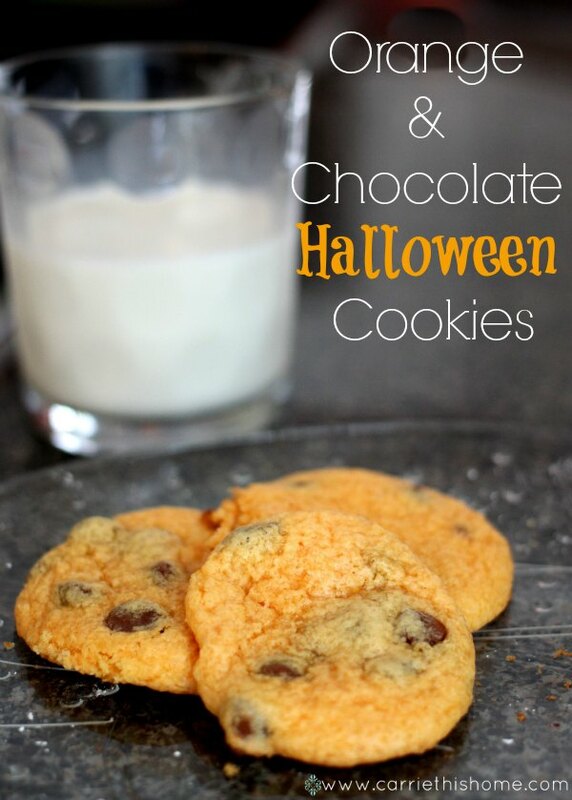 Try my Orange and Chocolate Halloween Cookies! This post shared at: Tasty Tuesday, Your Turn to Shine, The Weekend Re-treat, Eat.Create.Party!, Link Party Palooza, Best DIY Projects, Saturday Sharefest, Skip The Housework Saturday, Show Me Saturday, Inspiration Monday, The Makers, Hit Me With Your Best Shot, Whimsy Wednesday, Creative Spark, and Think and Make Thursday. It’s the perfect combination of pretty and delicious! It’s just as delicious as it looks! I love candy corn, so this recipe definitely caught my eye. I love that it sounds super easy, too! I am headed to the grocery store this afternoon to grab some candy corn frosting so I can give this a try. Thanks for sharing this awesome recipe! I’m honored you’re bringing one of my recipes into your kitchen! I hope you love it Christie! Thanks for finally talking about > 3 Ingredient Candy Corn Fudge < Liked it! 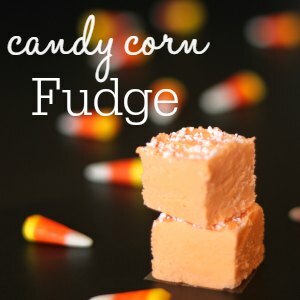 I loooove candy corn and to make it into a creamy fudge sounds amazing! Pinned! Thanks for sharing! I hope you love it as much as I do Sandra! Thanks so much for pinning this! I love this recipe, I’m going to have to make it for my American friends! I hope your American friends enjoy it, Michelle! I’m goibg to pin this. My best friend loves candy corn and doesn’t cook at all. I might make her some and send it up to NY. Thanks for sharing. I’m stopping by from SITS & I hope your having a great day! This recipe is easy enough even for non-cookers! That’s so sweet of you to make these for her! You’re friends are so lucky that they get to to be the first to try your experiments 🙂 This sounds fantastic and looks fun, too! It is so neat that you used the frosting and topped it with sprinkles. Hope you have a fantastic weekend, Carrie! The sprinkles were an afterthought that really made a big difference! Oooh this looks easy and tasty! I love the pretty orange color too! Oh I love simple and inexpensive recipes! Pinned this one for later! And shhhh you’re not the only one experimenting on your friends. Ha ha! Nice to know I’m not the only one! Looks like you’ve got some lucky friends, too! Ohhhh, pinned, can’t wait to try! These look so, so good! I am crushing on anything candy corn this fall, I am going to try this recipe out! Thanks Carrie! I heart recipes like this that are just as tasty as they are easy! Mmm! I love this easy and yummy treat. Perfect for our Oktoberfest party this weekend. I wanted to make sure I got to share this with my lovely readers in time for all the Fall parties! I hope you and your friends enjoy it Ashley! How easy! I will have to try this for our Halloween party this weekend! Thanks for sharing!